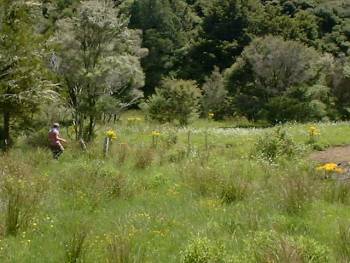 News from the farm in Diggers Valley, for the week beginning 11 January 2003. The week beginning 11th January, 2003. Cows seem a bit disturbed by the smell of other dead animals! Stephan was cutting up a sheep he killed last night and the cows on the other side of the house could obviously smell it. They couldn't see anything from where they were standing. The beginning of the week got rather lost in a sort of emergency. Stephan hasn't had new gumboots for far too long and he had a bit of a cut on his toe and then after he got bits of dead sheep in through the holes in his boots, his toe wasn't very well at all and he had to go to hospital to have it cut open. Now he has to keep the bandage dry, so we have to bath him outside. He isn't really grimacing about the temperature of the water, or any other physical discomfort - probably just about the fact that I'm taking yet another embarrassing picture of him to expose to all the world. Meanwhile, Gisela, our wonderful German Tourist guest, has carried on wiping rushes. The lovely yellow flowers are ragwort, which is now blooming all over the farm. So far we've managed to ignore them, putting off the inevitability of having to do something about the problem quite soon. 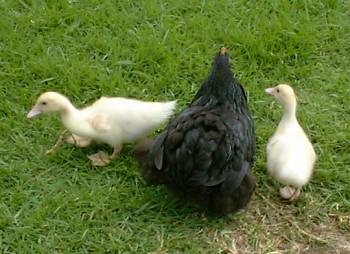 These are the Muscovy ducklings who are growing so fast. They've got big enough to let out for wandering times with their mother now (there's a stoat living at the bottom of the garden and we want to protect them from her).